Why LOGIC puzzles for kids? How will brain games for kids help? Well, here’s why! Me: LOL! You are funny! Its eleven! Logic Puzzles for Kids and Logical Thinking: What’s the big deal? Also known as critical thinking, logical thinking is the mind’s ability to make decision by evaluating information. Logical thinking starts budding at a very early stage, right when they start talking, and keeps on developing as you age. In lay mom’s words: to address a problem and come up with the best solutions is logical thinking. And these cool math games for kids are great way to get the logic ball rolling. Now that you have a rough idea, we have arranged a few logic puzzles for kids. These brain games for kids and thinking activities that will develop child’s logical thinking, be it a classroom or home. Children love to see different items in a grocery store. As they often accompany elders to the mall/store, this printable is perfect to develop child’s logical thinking. Fill up the grocery store racks with different items by following the instructions. Single players ranging in the age groups of 2–6 years. Cut out the items from the Item templates. Follow the instructions on the Grocery store Printable. Stick the appropriate items to complete the image. 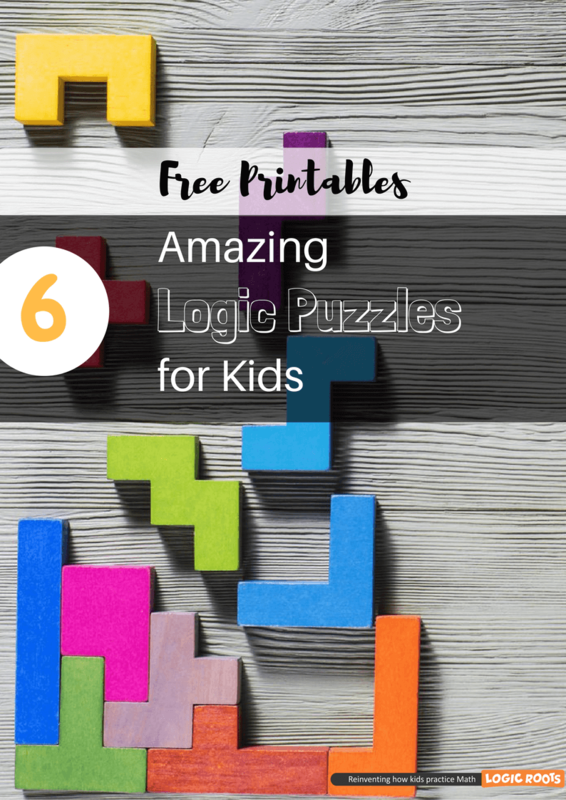 How will these logic puzzles for kids help? This is a fun way to invoke a sense of relation. As it is more of a match-making game, it helps to think rationally by classifying and identifying relevant information. This is a fun Math puzzle to really feed that brain with some logic. The best part about this logic puzzle is that it has several solutions for that everlasting non-repetitive fun! Write the numbers in the circle such that the sum on each side of the triangle must be equal to the sum of the numbers on every other side. Single player. Ideal for ages 2–5 years. Write the numbers in the circles for each triangle (numbers 1–6 for the 3 x 3 x 3 triangle or 1–9 for 4 x 4 x 4 triangle). These numbers should be written in such a way that the sum of the numbers on one side is equal to the sum of the numbers on every other side. That is, sum of side a = sum of side b = sum of side c.
Notes: For the small 3 x 3 x 3 triangles, arrange the numbers so that the sum of each side equals 9. There are also solutions for the total sums to be 10, 11 and 12. For the large 4 x 4 x 4 triangles, arrange the numbers so that the sum of each side equals 17. You can also find solutions for the total sums to be 19, 20, 21, and 23. To make it eligible for older kids, do not reveal the sum of the numbers and let the kids figure it out themselves. How will these Math games for kids help? This math game is a great way to improve child’s logical thinking. It not only increases their Math skill but also helps to think critically about the possible numbers, their sequencing, and test their hypotheses toward achieving the total sum. Sudoku is a great game thoroughly enjoyed by kids and grownups. In this cool Math game, you must fill up the grids with different colors and not numbers. Fill in the blank squares in the grid so that each row, column, and 3 x 3 section has only one of the colors of the rainbow. Any color must not be repeated in each row, column, or section. It is a single player game that is great for ages 4–7. Hand over the template and colored cutouts. Stick the cutouts in every square of the sections in such a way that one color appears in every row, column, and section. Notes: If short on supplies, you can use 6 different crayons. How will these brain games for kids help? This game is very logic stimulating because it involves studying cause and effect. In short, thinking about what will happen next (which color will go where) followed by why (adhering to the one color in every row, column, and section rule). Indeed, a great brain puzzle to develop logical thinking. To make it more interesting and fun for kids, it is necessary to include more fun puzzle games that involve critical thinking, guessing the patterns, reasoning it (Analogies), and fun with counting and matching. These 3 skills can be enhanced through our printables of brain games for kids (see link above) and math worksheets. Download FREE math worksheets that has math stories for kids to connect with. Write, draw, color, cut, paste and do much more with these colorful worksheets. Reading the problem, understanding it, analyzing it, and deriving a solution is a great way to improve logical thinking in a child. The puzzle (Can you solve it?) in the printable (Page 7, link above) poses word problem regarding the placement of shapes and thus, by the process of solving it, a child must think logically. Patterns are a great way to develop the sense of reasoning. Completing patterns based on analyzing previous patterns is a great way to develop child’s critical thinking. Such analogy-based problems are also an integral part of the competitive exams in your child’s future. S0, start young! Checkout Printable Page 8 in the link above. 1 2 3 4 and slash! That’s how you tally. See the chart and match it with the pictures (Printable Page 9 in the link above). How fun! These are the most basic games to enhance decision making skills. These math games for kids not only help to analyze situations but also mentally construct and validate reasoning (to choose a particular option). Also, these brain games for kids allow them to explain to their parent/teacher, giving an insight into child’s logical thinking. So, ruffle those logical feathers, feed that fat & able brain these great logic puzzles for kids and create a rational human out of your child! Did you find these brain games for kids effective enough? Leave us a comment.